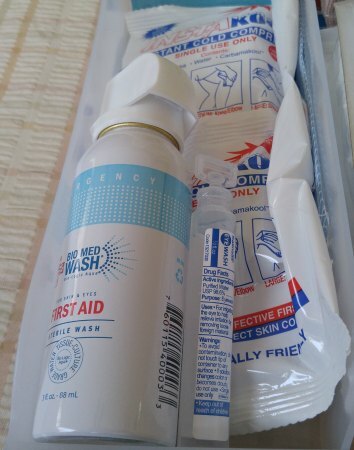 Home » MacGill’s First Aid Kit – How did it fare? This easy to navigate kit and instructions allows even those with limited first aid knowledge to administer effective first aid treatment. The kit is divided into 4 color-coded compartments. 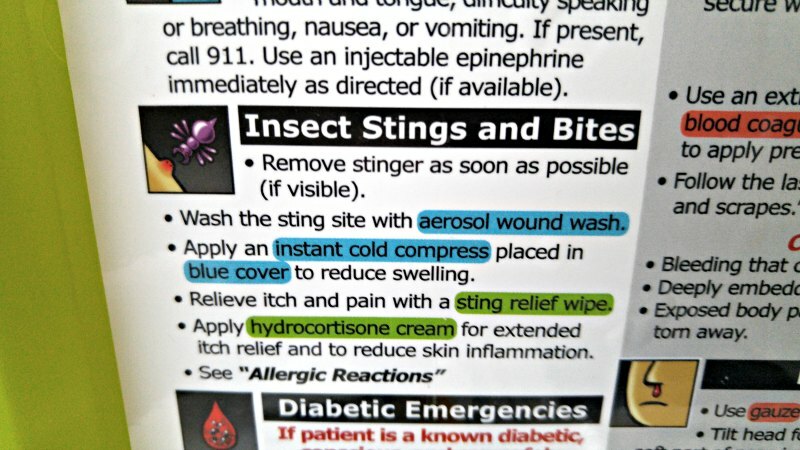 Color-coded first aid treatment instructions are prominantly displayed on the kit inside cover. The individual products are highlighted to match the section of the kit in which they are stored. 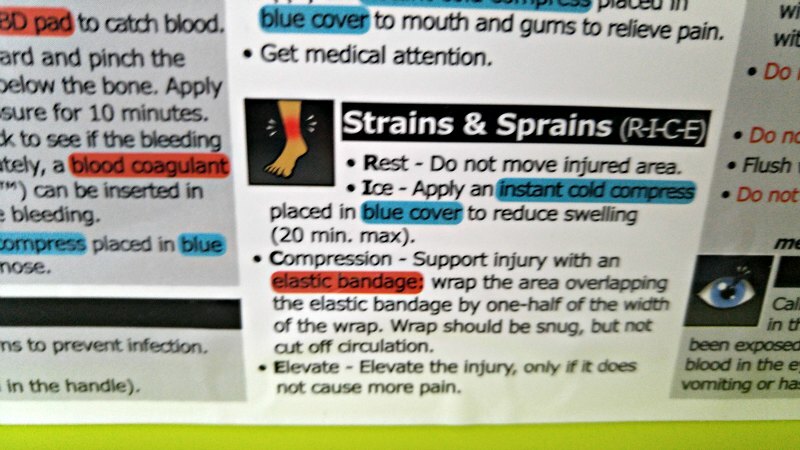 This color coding is designed to assist in finding the appropriate materials to treat the patient's injury. Initial Price Point for Most Families. Not enough of certain supplies. I was a Paramedic for 24 years before getting into the world of blogging. 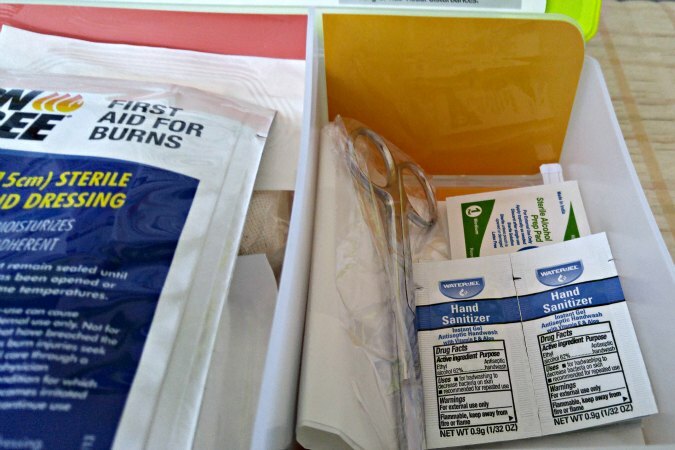 Here at Tom’s Take On Things I was given an opportunity to review a first aid kit from MacGill, a company that makes and sells a variety of health care products for school and safety programs everywhere. If it is one thing I know about. It is what is needed in first aid kits, jump bags, EMS Bags, and products like that. So what we need to do is break this down, and see how it compares to other things I have seen or used in the past. It pops out at you, doesn’t it? Easy to read, you know what it is, and conveniently easy to grab and go when needed. I think this is the best part of the whole kit to be honest. It is durable, and would be perfect to store in a school, at home, a vehicle, a boat, or anywhere a good first aid case is needed. Here is where the heart of the first aid kit lies. It’s contents. Does it have everything you need to deal with most minor emergencies or accidents that happen? It is a well constructed set of products that would service minor injuries, or provide basic care till advanced help like Paramedics could be called, or the individual is taken to an Urgent Care or Emergency Room. It has a wide variety of items to treat anything from basic cuts, to bee stings, a diabetic emergency, to a light burn. There are some items in this kit I wish there were more of in the initial purchase of it, but the company’s site does sell restock options for items in the kit. Here is where some basic first aid information is shared, to discuss some of the different symptoms that might occur, and some of the actions you can take to correct them. Well thought out, and helpful to someone who may have never dealt with something like this before. MacGill does say it’s not a replacement for proper medical care, and I emphasize on so many levels, if it’s not something you can handle call for 911 and let the boys and girls that are EMT’s and Paramedics to come save the day! Like in the instance of Heart Attack, if they are suspected of having one, definitely call 911, will come find you and slap you with a wet noodle if you don’t. But on the other hand, ask if they have an aspirin allergy before giving them aspirin, okay? You might make things worse if you give it without checking first. (okay, I stepped off my soapbox now) Continue to love and adore the rest of the review! So this is where I am torn a little. Is it a great first aid kit? I think so. Could it have a few more supplies in it? Sure. Is it right for vehicles, boats, campers, schools, and businesses? absolutely! Is it right for your home? Yes and No. Yes, because I think everyone should have a great first aid kit like this that is sturdy, and helpful in situations at home when you need it. No, at this price point. Not every family is going to spend $70 for a First Aid Kit for their home. Do I think you need a complete kit inside your home for your family, you are darn right I do. I love what MacGill has done here, and as a institution or facility this is a perfect choice. For the home, I am hoping MacGill will find a way to price point this at maybe $49.99 to appeal to the average family that this would benefit. Be sure to buy yours here if you are interested in picking up 1 or 10! We keep several kit here at home. We also keep one in each vehicle. This is a nice kit. I like the way it is packaged. Although it is very basic it would e useful in many instances. I like it. Will have to work on getting me one. I love that this carries the important things that you need in case of anything happening, but it doesn’t protect you if you have a azsma attach or allergic to medication or foods so one should always ask ?, its so important.. This was an awesome and interesting review!! I too believe that every home, Business & School should have a full filled First aid Kit. They should also be on camping trips and Boating trips etc. You Never know when these life saving ,pain saving items will be needed! I especially like that they Included a Glucose item for the Diabetic! This is a Great first aid kit. Sure its a little on the high end price scale! But I believe in you get what you pay for! This is really worth it to me!! This looks like a great product! Thank you for serving our country. This would be a good kit for earthquake preparedness. Thanks for sharing! Hey Tom, this is an awesome kit, love the review, I would definitely love to have one of these, you can never be too prepared in case someone needs minor medical attention. 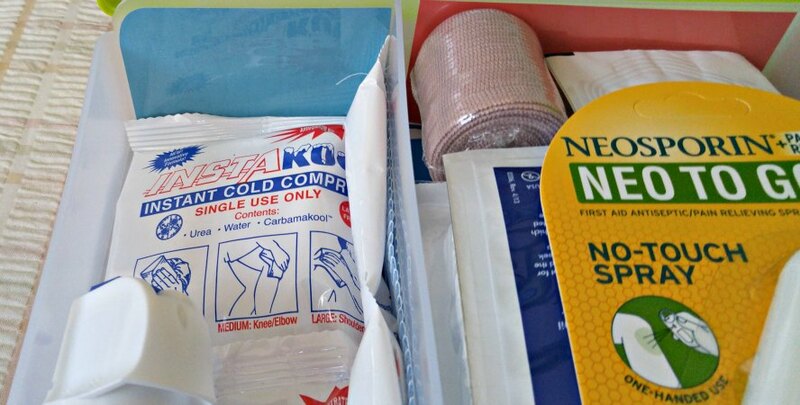 Despite being a costly first aid kit, it sure has a lot of products. I love the bright color of the case so it’s easy to find in a messy trunk. The many compartments make it a well organized kit! Looks like a perfect kit! I really like that it is Color-coded! Thanks for the review! All good points I think. I have Band-Aids and Alcohol and Peroxide at home but that is about it. Price point is definitely a big concern since it is something you may never use. I am always worried about what you do in the event you do use a lot of it. Do you just buy a new kit to replace the old one, or do you buy refills of some sort? This kit seems sort of expensive for what’s in it. I have a kit in my truck and my wife’s car. We are both medically trained her being a paramedic and my self a paramedic and nurse. You can find kits that have more for cheaper the kits we have were around 30 or 40 bucks. I agree with you, every car should have a kit in it along with every home. This is a nice kit just a little expensive. I like that the kit comes with more then just the basic bandages and Antibiotic ointment. I also like that it comes with an instruction booklet . I think that this first aid kit is wonderful and helps give an emergency better help. Thanks so much for your comment Jerry, I agree. Thanks for stopping by, have a great day! Looks like a great first aid kit but a little pricey.. I agree that $70 would rather pricey and that under $50 would be more reasonable. It does sound like it has a lot of good items, some I would never have thought of including like glucose gel. Thanks for posting this review! This is such an important thing for every family to have. I appreciate your honest opinion of this first aid kit. I agree that the price point would make it difficult for some young families to be able to afford an item that is desperately needed in every home. I love that things are color coded and it has everything in it that you would need in a First Aid Kit. Most aren’t packed full of things that this one has, and that’s not really a good thing. I would definitely be interested in purchasing one of these for my home! My first thought on reading your review was how convenient and practical it would be to have this in the car. Also reminded me I need to get a first aid kit for the car as my son and I will be going on a road trip from MO. to CA. in May. I really need to invest in a first aid kit for my family. Thanks for providing both the pros and cons of this particular kit. I like that it doesn’t look like other kits. We don`t have one and as bad as we are about getting injured we need one. A good first aid kit can be a lifesaver. In your home, auto or garage it is a good idea to have one handy. I know that one we have in garage has come in handy when my husband has hurt himself out there. He was able to stop bleeding before he went to the Dr. I love how sturdy this looks and some of the things in it are very very useful In particular asprin (heart attacks) and gluclose as we know several diabetics who visit us. Great thing to have around for sure. Hubby’s school friend was an EMT for 20+ years and is still at the fire department. I dont mind seeing him but I would rather it be social than professional and with a good first aid kit, it can help. This is a nice kit. I would like one for the house and one for each car! I really liked the kit, I agree for some families the price tag would be steep. But if your family travels, does a lot of activities outside (or inside) then that could be a small amount to prevent a worse accident. So many types of problems need to be addressed as soon as possible, I had a situation like that, I was bitten by a Brown Recluse Spider and and the medical bills would have been far less if I had addressed the bite earlier. We have so many new strains of insects and reptiles. The kit looks like it covers just about any thing that could possibly come up. I would add that anyone that has a current medical problem to make sure you have a list of your physicians and medications along with extra medications in case you are out of town and get delayed on your journey back home. The color is great, it really stands out!! Great to have that like you said to grab in a hurry. You don’t want to be fumbling trying to remember where you put it. First aid kits are a must. Everyone should have one. Such a great review. I love the hard case of this first aid kit. I have a few that I keep in the house and cars…. Can you ever really have too many? The price is a bit steep for me though…. Being on a tight budget, this would definitely stop me from purchasing this one. Sure, we all need one, but this is quite expensive! This would be very handy to have , definitely would be something i would find useful in my house. This would be great to have. Every house and car should have a good first aid kit. I have to agree with you that the price point on this kit is too high!! Thank you for reminding us to keep a first aid kit in our homes and cars though. Great review! It is very thorough. I always think that, whatever the kit may be, there should be more supplies! Especially the everyday type supplies like band aids and ibuprofen. No matter how much I try, I cannot keep the first aid kits from being raided of those things. Even the ones in the bathroom where the medicine cabinet is, haha! I think this would be a great kit to have. Thanks for the review. I love the bright color and how easy it is to transport! The contents of this First Aid Kit outweighs the cost! 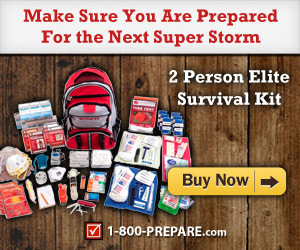 Having what you might need in an emergency situation, all in one convenient Kit, could prove to be priceless!! Very nice review!! Thank you Elizabeth. I love mine. I appreciate the kind words, if you share the post anywhere, that would be awesome! I like the first aid information sheet included with this kit. I have had some in the past (cheap ones) that did not contain first aid information. I noticed this kit contains items not found in cheaper kits such as eye wash, blood coagulant, thermometer, and larger variety of bandages. Overall it looks like an awesome kit. This first aid kit has a lot of different items in it. Impressive! Yes, that looks like a very handy first aid kit to have in anyone’s house. Thanks for the review. Thank you Tom for the review. We don’t have a first aid kit in our house. But I will get one I know we need one. Thanks Denise, for stopping by. Be sure to share this with everyone. Share buttons, below and above the post! Thanks! So important to have. Thanks for all the years of your service! I think you’re right, it’s a bit steep for some basic stuff – but I do think every house/boat/car, etc should have a basic first aid kit. thanks, your review was really helpful! It looks like it is packed with so many useful items and that they are well placed. Well put together and easy to use. I like the idea of color coded. My husband needs 2-3 kits for his working bus & trucks & this would be great for him. The price is a bit steep for me but it’s good to have these both in the home and in the car. Seems like a good first aid kit. Thank you for sharing. Very nice first aid kit. This is an awesome fist aid kit, you never know when you gonna need one. This looks like a complete kit with all the essentials necessary for an emergency or quick first aid. This is a pretty good kit. I would add a few things on my own…sutures, hemostats, ibuprofen, acetominaphen, a CPR mask for the squeamish. I don’t see adhesive tape listed, though that might be a reading error on my part.. I’d also toss in an inexpensive wrist B/P monitor, ammonia inhalants, and a thermometer. But I guess you can customize it & add your own stuff, too. Does it come with a quickie BLS guide? Like a quick CPR how-to? But I think everyone should be certified in that, anyway. And if this is going on a vehicle, boat, etc., water purification drops, or a similar item. What did I forget? I defibrillialtor, portable x-ray machine, a small MRI machine……..somebody stop me! This is a great first aid kit and better than most I’ve seen. I really like it. I think $49.99 to appeal to the average family is very reasonable. This does look like it has more things to help in more situations than first aid kits I’ve bought in the past, but I agree with you, it’s more than I would most likely pay. 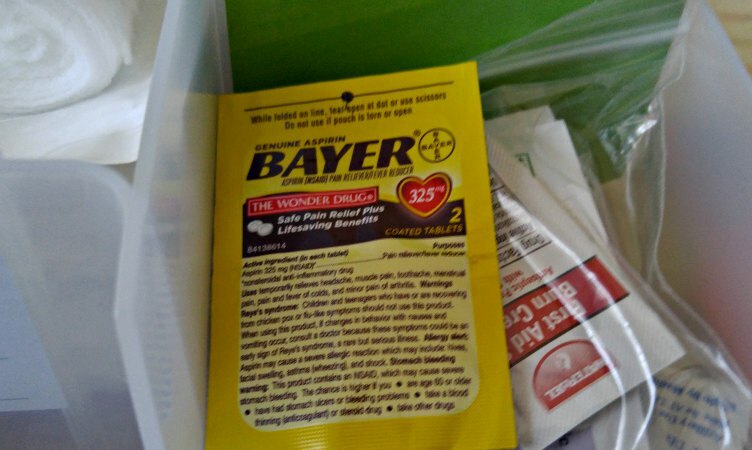 As it is most of the things in my smaller, less inclusive first aid kit have to be tossed because they aren’t used before their expiration date., so it would be quite a waste for me to spend more for things I’d eventually have to toss. This does look like a great kit though, would like to have it, and if I owned a business I would absolutely buy it. That’s quite the first aid kit! Love learning about new brands! I dont have a first aid kit and really do need one with taking care of my 3 grandkids. The contents of the giveaway case are an awesome variety of items that every household should have. I like this first aid kit! The colour does pop at you and I like the essential inside! With all your years of experience, I trust your opinion!! You had hands-on training & experiences that should count for something. I never heard of Macgill before, but the first aid kit looks packed with what an emergency needs! I appreciate that Sue. I do plan to review more first aid kits here on Tom’s Take On Things. Just need more companies to find out that I exist! Have a great day, don’t forget to share the post with everyone. I work in construction and need a first aid kit in my crew truck. This one looks like it would be able to fit underneath the back seat no problem, high visibility and packed with all of the essentials! Fantastic review. This would be a first aid kit that I could definitely use in my home. Like this emergency kit with all necessary items to treat simple wounds. Thanks for the info. Nice review! Look like this kit has everything. I love that it has supplies for diabetic emergencies, since most kits do not include this. My husband is diabetic and that would be something I look for in the kit. I think the healthcare professionals in my extended family would think I was prepared with a kit like this. It’s always good to have complete kits, wherever you go, especially if there are children around! This looks like a great kit! My car, came equipped with a great kit, and we have two in the house, one at each end of the house! Thanks so much for the opportunity to win this awesome kit!!! It would be an honor and a blessing to win it!!! Love this kit, we forget how important it is to have, we need to be more prepared! This would be good for the car or camper. Thanks for your review Tom. How to share it, if I don’t have a blog? This kit has everything in it. I think it is a great first aid kit. Thank you for being a paramedic & helping people. I so appreciate your comment. Have a fantastic day! I appreciate your honesty and expertise! Thanks for the review. I think it is a great kit to have! You did an awesome job with your review! Very insightful, and I think it’s great that someone with your previous medical experience did this review. If you don’t mind, I am a bit curious as what else you would add to the kit. Thanks for the comment, I do appreciate it. Be sure to share the post with others, would be a big help! Not to much. Really just more of what’s already in there. One packet of chew-able aspirin is just not enough. I think the items in general are fine, just more of them. And a slightly lower price maybe. Like the $50 range I suggested. Thank you for the great review. Everyone should have a good first aid kit on hand, especially when you have chidlren. Thanks! It is a little heavy on the price. However if you have a kit like this and needed it at sometime instead of a clinic or hospital visit. The price is then justified. I was very interested in the kit until the $70 price tag – that’s expensive. I typically have a lot of this stuff together already for when we travel. I agree that a price tag of closer to $50 would make it more enticing. Looks like a good overall kit to keep on hand but I think I could put one together for less. It might be worth it though for convenience sake. Sounds great and I need to update my kit in the car. Thanks for sharing. This looks like a great first aid kit. Everyone should have one of these in their house and car. So important! I definitely would say that having a kit like this would be a very good idea. It’s a bit steep in price. The items that would probably be used the most are the antiseptic spray, the antibiotic ointment and the bandaids. Great review and insightful to his expertise. Helps the average Joe to understand and appreciate the entire picture of what’s being represented. I agree with the cost coming down to being more affordable and appealing. Thanks for the great comment Gale. I hope they do lower the price. I still love the kit. Very sturdy, and visible to most. Be sure to share this with everyone. Or anything else on the site! Thanks. I need one and this kit is good,would love to replace my old almost empty one with this bright one ! This is a fantastic first aid kit!!! The comes with such a large variety of supplies! This is definitely the kit to have on hand! I like that it gives you the basic first aid on the inside cover! Other kits usually have a booklet or something similar and who’s going to be looking through a book in an emergency?! Much easier to just look on the inside cover to find what you need! I’ve never used a first-aid kit, and I appreciate the features they include (particularly the prominent display of instructions and color coding) to help eliminate confusion. If this were a better price, it sounds like it would be a great option for those like myself. I would definitely want one of these if they changed the price point closer to $50 as you suggested. I like that it has glucose gel. 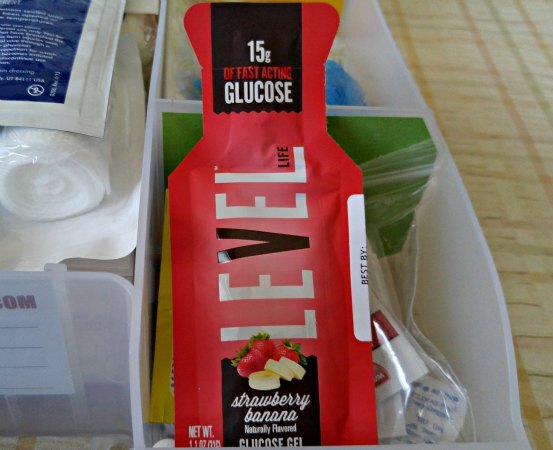 In my life I have come across many, many diabetic emergencies and this would come in hand. My ex-husband and my fiancé are both type 1 diabetics and between the 2 of them I’ve done my fair share of glucagon injections, glucose tablets, and cake icing. But beyond that, I have come across diabetic emergencies while out shopping and at work as well. I feel it’s somehow drawn to me. Lol. I agree that $70 is a lot for a family & for myself as well. It does have a lot of things that can be useful in case of an emergency. Just yesterday here in California we had an earthquake, pretty scary thing. We have no First aid kit in my home or anything prepared for an emergency. This is a really good fist aid kit, although instead of a light stick, I would have to replace it with a pen light. Overall, It’s very versatile and has plenty of items included that would be very useful.